Happy mid-week! Today, I'm going to show you my nails that I've been rocking for the week. Since I am still in denial that summer is already over here in my country, I sported a mint green nail polish to still feel the summer. It is my first time to try a product from Tony Moly. My sister gave me lots of nail polishes two weeks ago. The other brands she gave left me overwhelmed. I got Chanel and Dior! I can't believe I can try such branded products for my nails. Oh yeah, I'm a happy kid! I decided to try Tony Moly first. Tony Moly is a Korean brand product. I long to try a color something like this. If you didn't know yet, I love anything green because I fall on Warm tone. Of course, wear a color that will flatter you. You don't know yet what tone do you fall? Click here to determine yours now. When my sister handed this over to me, I noticed first its packaging. 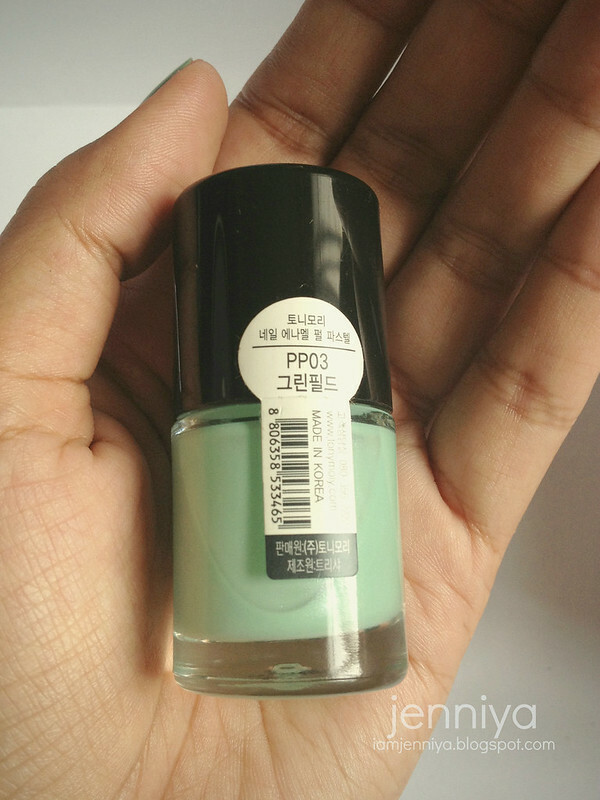 It's my first time to see a nail polish with rounded bottle and a cap in the same size. It looks sleek. When I see the content in the bottle, I saw it has shimmer. My lips then pouted; it's a sign that I might dislike it because this kind of consistency tends to streak like forever. But I was so wrong when I finally gave it a try. Honestly, I find the nail brush a bit annoying because the brush strands looks thick. But I was really impressed and bad impressions had gone vanished when I did the first stroke onto my nails. I applied it first on my pinky and the brush flared widely and distributed the polish in one stroke. It opaquely covered the nail. Wow. And not only that, the brush tends to get more products so when you applied it onto your nails; you get even application from your top cuticle down to your nail tip. Impressive. It also dries quickly. I am amazed how the polish gets dry in as fast as 2 minutes. You can opt to wear the polish alone without a top coat because the micro shimmers does the shine making the nails looking glossy. It streaks but not the way I expected it to. The streak is shallow; almost unnoticeable, believe me. For a shimmery nail polish like this one, I can say they did a great job with the formulation. I applied two coats onto my nails. The nail polish seems to get darker when applied onto nails. I thoroughly check the one in the bottle and my nails; it really turned darker. But I find it okay since it made the color more alive and look brighter. I gave this product a rate 5 out of 5. 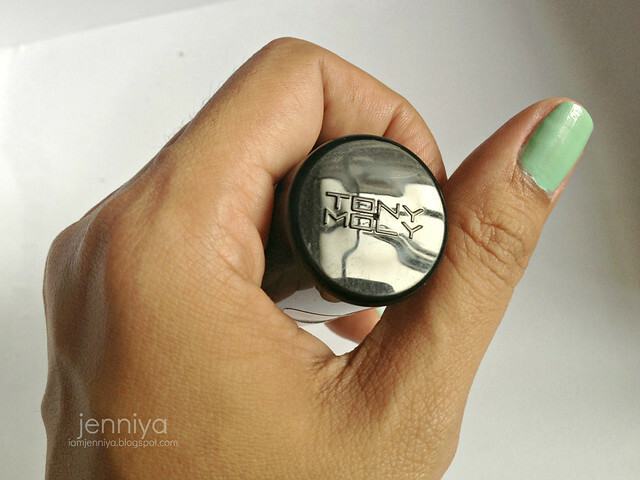 Have you tried Tony Moly nail polishes? Visit Tony Moly website: www.tonymoly.ph and like Tony Moly Facebook. I actually own a lot of Tony Moly nail polish! I love them! The colors are pretty. I love the color of your nails! Definitely gives out a summery vibe! It's such a pretty color! Love your nails! I haven't tried any Tony Moly polishes, but I have a face mask! So cute! That color is so so so perfect! this nail polish is amazing. most beautiful color for summer! great post hunny i love this colour! Very pretty colour and you have such long, elegant hands! that's nice color..! maybe I have to try Tony Moly nail polish..
looks very nice *_* your blog is very lovely and interesting. im glad if you visit my blog, too <3 keep in touch! What a gorgeous colour, I love the green so much! This is the perfect mint!!!!!!!!!!! So beautiful! I love mints!! These nails are so cuteee!! I'm in love with that color!! Love that minty color - so pretty! Lovely color! Your manicure looks great. The color looks gorgeous! I need to have this! Thanks for the review. Thank you sweety for your lovely comment on my blog and of course i'm following you on bloglovin and facebook!Can you follow back? Thnaks for your comment, cute blog and lovely color! I'm following on BL, GFC & FB! That colour is just so amazing! ahh thank God I bumped into this blog, to this post..and now I'm totally sold to this nail color. I love that shade of green. Looks good one. Fantastyczny ten lakier, cudnie wygląda na paznokciach. Smalto carinissimo (; Reb, xoxo. Take a look at our blog, if you like it, maybe we can follow each other via bloglovin!? If you follow me via GFC and bloglovin, I will follow you back! Hey J, I've never heard of the brand - but i must admit the color is beautiful. Awesome colour!! Really love it. Very nice color! I'm following you back! wow.... it looks really nice on you and it suits summer!!! What incredible nail polish! I just love that color! Perfect for summer! I'm mint obsessed and this is a brand I hadn't heard of before, I'm glad it's on my radar now. This is a brand I hadn't heard of before, and I adore that color so I'll have to go pick it up. cute color! thanks for sharing. lovely blog as well, perhaps we could follow each other on Bloglovin'? please feel free to check out my blog and let me know if you'd like to. Ese color siempre me tiene loca, y cuando me lo veo puesto me lo quito con rabia, porque siempre creo que no me va demasiado! how cute is this nailpolish! totally perfect for summer. Oh such a pretty colour, prefect for the summer! Absolutely love that color, it's so Summerish! It will mean a lot if you have time to check my blog and maybe follow if you like it ?! There's an amazing giveway on the blog, you can join it if you want it ! love your nails! mint is my favorite color. your fingers are so long and pretty as well! Beautiful color! I just adore the Tony Moly brand! I've tried some Tony Molys and their brushes are a bit wide but they spread nail polish the right way. Hehe. And I can't wait for your Chanel and Dior posts.